A3+ Size 7.6 x 16.25 in. (193 x 413 mm) 13 x 19 in. MEDIUM 9.8 x 20.9 in. (249 x 530 mm) 13.3 x 24 in. 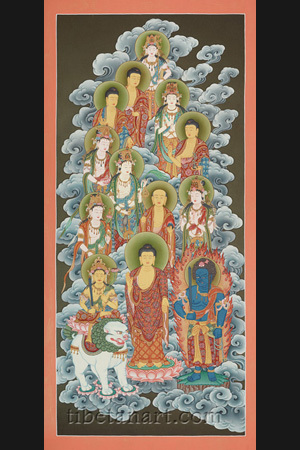 This painting shows the assembly of the 'thirteen deities' of the Shingon School of Japanese Buddhism. Shingon, meaning "True Words", developed from the teachings of a Japanese monk named Kukai (774-835), who was later recognized as the Eighth Patriarch of the 'Esoteric School' and known as Kobo-dashai. The thirteen deities of Shingon are essentially derived from the 'womb-realm' and 'vajra-realm' mandalas of the great yoga-tantra deity Mahavairocana, and during the Japanese Edo period (1603-1867) each of these deities protected children up to puberty or their thirteenth year. In chronological order (from the first to thirteenth) year these deities are: Acala, Shakyamuni, Manjushri, Samantabhadra, Kshitigarbha, Maitreya, Bhaisajyaguru, Avalokiteshvara, Mahasthamaprapta, Amitabha, Akshobhya, Vairocana, and Akashagarbha. This painting depicts the assembly of the 'Thirteen Deities' (Jap. jusanbutsu) of the Japanese Shingon School of Vajrayana Buddhism. Shingon, meaning 'True Words', is derived from the Chinese and Sanskrit terms for mantra. This tradition developed from the teachings of a Japanese monk named Kukai (774-835), who studied in China for several years with Hui-kuo, the Seventh Patriarch of the 'Esoteric School'. After Hui-kuo died Kukai was recognized as the Eighth Patriarch, and was subsequently known as Kobo-daishi. The Shingon doctrine is primarily based upon the Sanskrit texts of the Mahavairocana-sutra and the Vajrasekhara-sutra, and their two principal mandalas, which are known as the 'womb-realm' (Jap. taizo-kai) and the 'vajra-realm' (Jap. kongo-kai). Mahavairocana is the universal or 'Primordial Buddha' of the Shingon tradition, and the goal of its practice is to realize that one's essential nature is identical with Mahavairocana as the 'Ultimate Reality' of the dharmakaya. These doctrines of 'Japanese Esoteric Buddhism' are transmitted orally from master to disciple, and its practice essentially employs the 'three secrets' of mudra, mantra and meditation to purify the three aspects of body, speech and mind. The thirteen deities of the Shingon School are derived from the main deities of its two mandalas. During the Edo period (1603-1867) it was customary for a child to be taken to one of the temples of these deities during each of the first thirteen years of its life, with each deity serving as an annual protector of the child's life until the onset of puberty. At the end of life they also serve to protect departed souls through the various stages of the afterlife: with the first seven deities protecting each seven day period during the traditional forty-nine day interval of the 'intermediate state' (Tib. bardo; and the last six deities corresponding to the memorial services performed on the hundredth day after death, and the first, second, sixth, twelfth and thirty-second year anniversaries. The Japanese and Sanskrit names of these deities, which correspond to the first thirteen years of a child's life are given below, as are the sequence of days and years that correspond to the traditional Japanese funeral rites and its memorial services. Five of these deities are Tathagatas or Buddhas, seven are Bodhisattvas, and one (Acala) is a wrathful protector or 'King of Knowledge' (Skt. vidyaraja). 1. Fudo Myoo (Acala), the 'Immovable Lord' (Skt. acalanatha), appears at the bottom right of the painting. Acala is wrathful and blue-black in colour, and he stands upon a vajra-rock formation that represents his unshakeable nature. He is surrounded by a blazing mass of fire that consumes all emotional defilements, his tawny-black hair is coiled up into twisted knots with a single lock falling to the left, and a pink lotus adorns his crown. His fierce face has a frowning and distorted expression as he bites down on his lower lip with his protruding left fang, and upward with his protruding right fang. His left eye squints downward, while his wide-open right eye gazes forward. These facial aspects represent his compassion for those who are suffering (left), and his desire to lead them to liberation (right side). In his right hand he holds a wisdom-sword that cuts through ignorance, and in his left hand he holds a rope-noose that binds the defilements of attachment and aggression. 2. Shaka Nyorai (Shakyamuni), the historical Buddha, appears at the bottom centre standing upon a pink lotus, and wearing embroidered red robes. With his raised right hand he makes the abhaya-mudra of protection, and with his lowered left hand he makes the boon-granting varada-mudra. 3. Monju Bosatsu (Manjushri), the Bodhisattva of Wisdom, appears at the bottom left. Manjushri sits in vajra-posture upon a pink lotus that rests upon the back of his white lion vehicle. He is golden-yellow in colour and holds the attributes of a wisdom sword in his right hand, and the stem of a lotus that bears the text of the prajnaparamita-sutra in his left hand. 4. Fugen Bosatsu (Samantabhadra), the 'All-Good', appears as the third white Bodhisattva on the left above Manjushri. Samantabhadra's attribute is a pink lotus blossom, which he holds in his right hand. 5. Jizo Bosatsu (Kshitigarbha), the 'Womb of the Earth', appears in the form of a shaven-headed monk just behind Shakyamuni Buddha. Jizo is one of the most popular deities in Japan, and he commonly appears in the human aspect of a monk rather than in the divine form of a Bodhisattva. In this form his image is often found at dangerous places, such as mountain passes, crossroads, bridges and cemeteries. In the Shingon tradition Jizo has six manifestations that protect beings that suffer within each of the six realms of cyclic existence, and those who are weak and infirm often wear his protective amulets. Jizo is golden-yellow in colour and wears the embroidered robes of a monk. With his right hand he holds a khakkhara or mendicant's staff, which has six rings that serve as rattles on its ornate top; and with his left hand he holds a radiant jewel. 6. Miroku Botatsu (Maitreya), the embodiment of 'Loving Kindness', appears as the second white Bodhisattva on the left above Manjushri. Maitreya is destined to become the Buddha of the future, and he is adorned with the symbol of a stupa upon the crown of his head. His attribute is a golden water-flask, which rests upon the flowering lotus that he holds in his left hand. 7. Yakushi Nyorai (Bhaisajyaguru), the 'Medicine Guru', appears as the third figure on the right above Acala. The Medicine Buddha is golden-yellow in colour and wears embroidered red robes. With his raised right hand he makes the abhaya-mudra of protection or dispelling fear. With his left hand he holds a medicinal-bowl made of blue beryl gemstone, which contains a stem of the medicinal plant myrobalan (Skt. arura). 8. Kannon Bosatsu (Avalokiteshvara), the Bodhisattva of compassion, appears at the left centre, above and between Jizo and Miroku. There are thirty-three principal forms of Avalokiteshvara in the Buddhist traditions of Japan, and a hundred temples are collectively dedicated to him on his three main pilgrimage routes. In this painting Avalokiteshvara is white in colour, and bears the small image of Amitabha on his crown. In his right hand he holds a slender vase containing water or 'sweet dew', and in his left hand he holds a willow stem. These two attributes are commonly held by Kuan Yin, the aspect of Avalokiteshvara as the "Goddess of Mercy" that 'hears the cries of the world', who may appear in either a male or female form. 9. Seishi Bosatsu (Mahasthamaprapta), 'He who has attained great Strength', appears as the white Bodhisattva directly above Acala at the centre right. Mahasthamaprapta and Avalokiteshvara are the two main attendants that traditionally appear to the left and right of Amitabha Buddha (Amida) in his 'Pure Land' of Sukhavati, the 'realm of bliss'. Here he appears with his hands palms-folded in the anjali-mudra of veneration, and with the small images of the Five Buddhas adorning his crown. 10. Amida Nyorai (Amitabha), the Buddha of 'Boundless Light', who appears as the fourth figure on the upper left above Manjushri. In Japan Amida is widely worshipped through the chanting of his six-syllable name, 'Namu Amida Butsu', which for the devotees of Amida's 'Pure Land' schools or traditions is believed to lead to an auspicious rebirth in Amida's western paradise realm of Sukhavati. Here Amida Buddha appears with a golden-yellow complexion and wearing embroidered red robes. With his raised right and lowered left hands he joins the tips of his forefingers and thumbs together in the gesture of 'giving refuge in the Three Jewels'. Amida may also appear making this gesture of welcome into his Pure Land by holding both hands in front of his heart, but more commonly he sits with both hands resting upon his lap in the dhyana-mudra of meditation. 11. Ashuka Nyorai (Akshobhya), the 'Immutable One', appears directly above Amida. Akshobhya Buddha presides over the eastern paradise known as Abhirati, the realm of 'extreme bliss'. He is golden-yellow in colour and wears embroidered red robes. With his left hand he holds a fold of his own robe as a symbol of renunciation, and with his right hand (not shown) he usually makes the 'earth-touching' gesture. 12. Dainichi Nyorai (Vairocana), the 'Illuminator', appears at the upper right and directly above the Medicine Buddha. As Mahavairocana, the 'great shining one', he is the main central deity of the Vajradhatu Mandala and the principal Buddha of the Shingon sect. He appears here in the form of a white Bodhisattva who bears the small images of the Five Buddhas on his crown. With his two hands Vairocana makes his specific bodhyangi-mudra or gesture of 'principal enlightenment', which is performed by enclosing the raised forefinger of his left hand within the 'wisdom fist' of the fingers and thumb of his right hand. This gesture represents the element of wind or 'life' being embraced by the Five Buddha Wisdoms. 13. Kokuzo Bosatsu (Akashagarbha), the 'Womb or Sphere of Space', appears as the white Bodhisattva at the top of this assembly. His usual attributes are a wisdom-sword and a wish-granting gem, which he holds in his right and left hands. But here he holds a trident-staff in his left hand, with the emblem of a triple-gem appearing on his crown.